Super Bowl is just around the corner. Do you have your menu in order? If you are trying to stick to a low carb diet this month, Super Bowl, and other parties involving comfort foods, can be a little daunting. Can you participate without busting your diet? Sure you can! With just a little planning, you can have all your favorite game day flavors, without the grains and heavy carbs. This simple Low Carb Burger Bites Recipe offers all the best flavors of a juicy burger, without the bun. 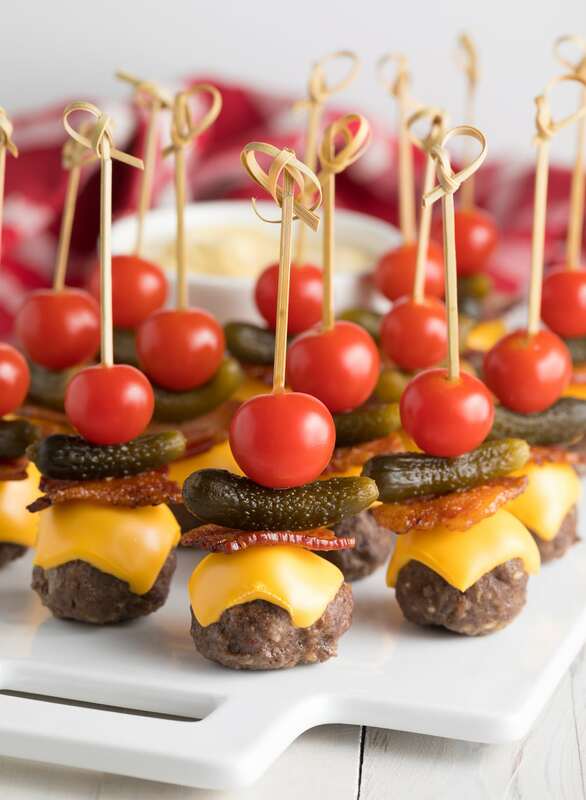 Each little burger bite toothpick contains a flavor-packed burger meatball, melted American cheese, crispy bacon, pickle, and tomato. You can serve them as-is, or dip them in a simple “secret sauce” made with 4-ingredients… Mayonnaise, ketchup, mustard, and garlic powder. Ground beef – I usually go with ground chuck, which is about 15% fat, for juicy mini burgers. 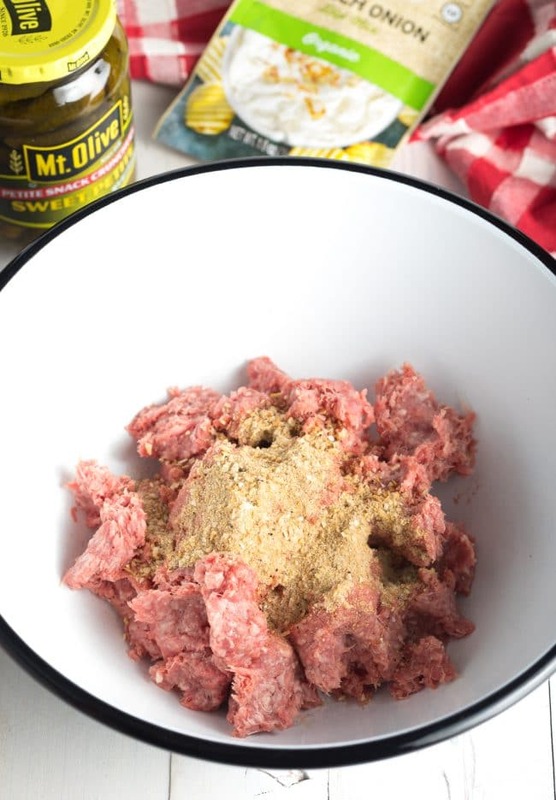 French onion dip mix – This provides all the seasoning and rich flavor in the burger meatballs. Bacon – Baked to crispy perfection! American cheese – Really, is there any other cheese, when it comes to burgers? 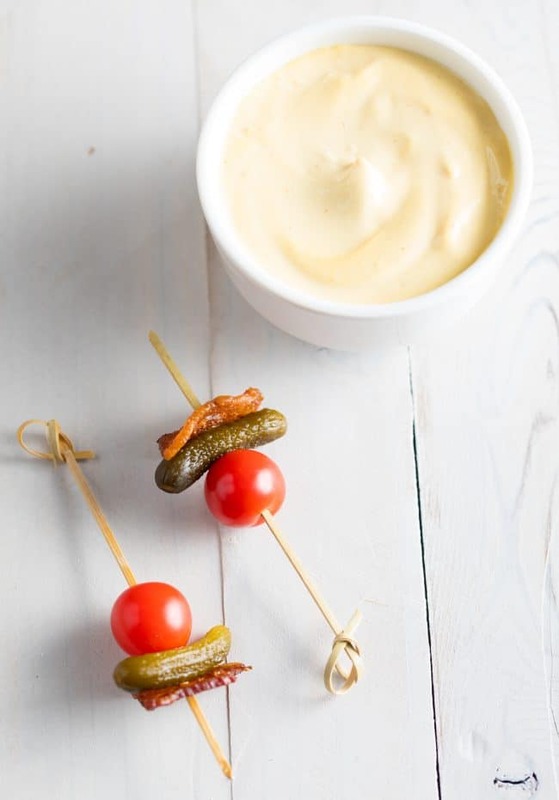 Gherkin pickles – These little sweet pickles are just the right size for our burger bites. Cherry tomatoes – For a bright fresh pop of flavor at the end. Making these grain-free mini burgers could not be easier…. Season the ground beef with a French onion soup mix packet. Roll the ground beef into little balls. 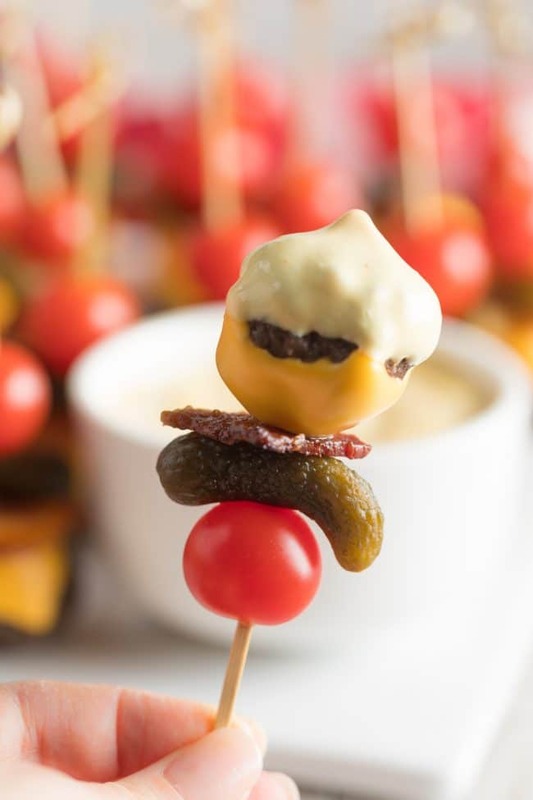 Place on toothpicks with bacon, pickles, and tomatoes. 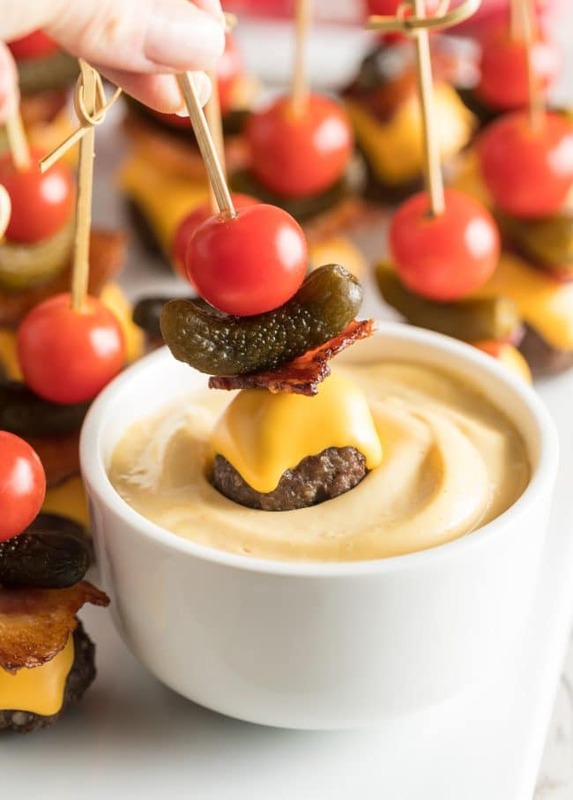 See the Video & Full (Printable) Low Carb Burger Bites Recipe Below! 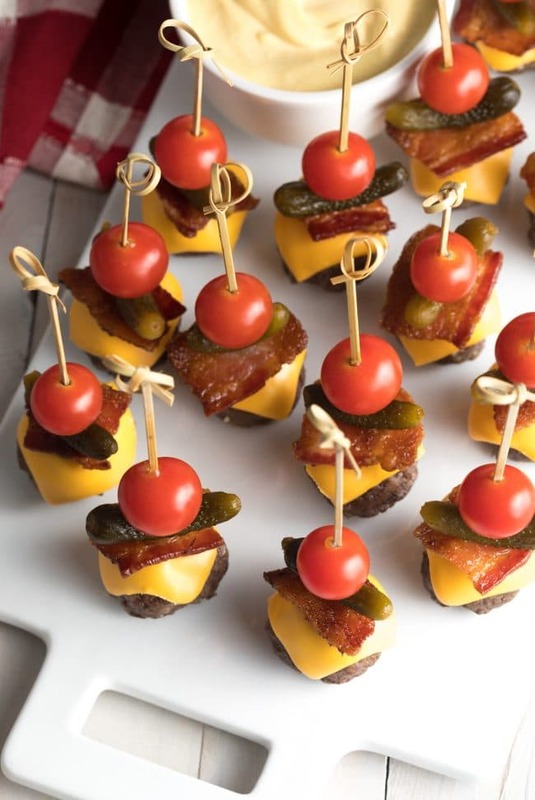 Can I serve these burger bites at room temperature? Absolutely! They taste fabulous straight out of the oven. But they also taste great at room temperature. Can I make the burger bites ahead? 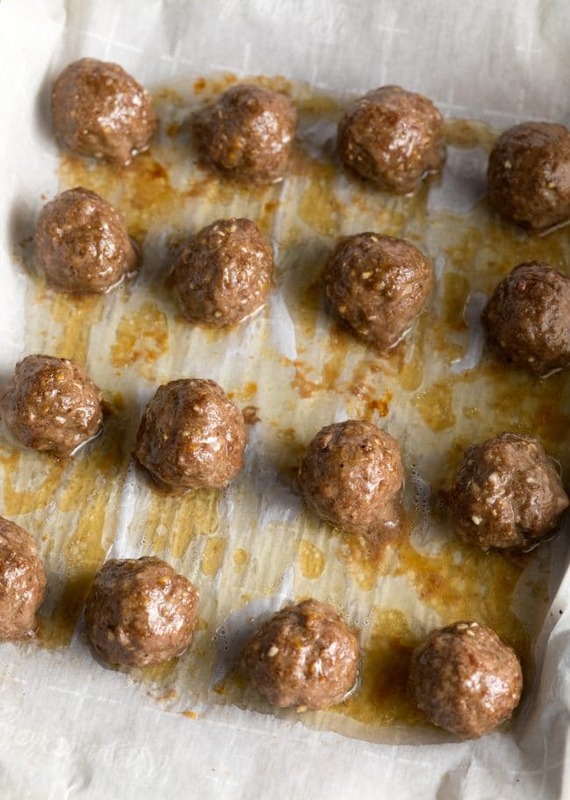 You can mix the ground beef and roll it into balls 1-2 days before baking. However, I would not bake the meatballs and assemble until right before serving. Can I swap out the toppings? Of course! 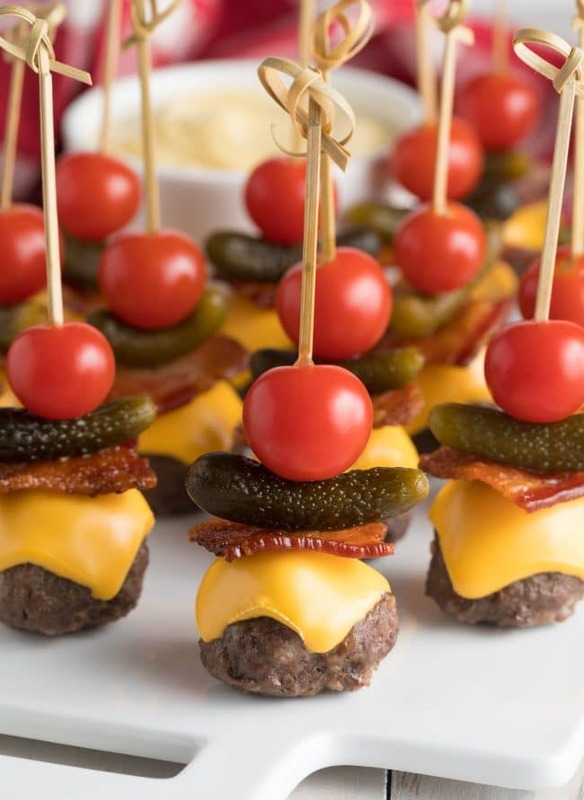 Just be sure to select burger toppings that slide easily onto toothpicks. You can use any type of cheese you like. However, American cheese melts beautifully, and maintains its appeal at room temperature better than other cheeses. Is French Onion dip mix gluten free? Most of them are. However, if it’s important for your health, double-check the ingredients in the packet. Can I make the French onion mix from scratch? Absolutely! 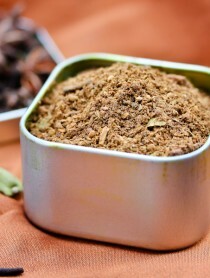 Just combine 1 tablespoon beef bouillon, 2 teaspoons dried onion flakes, 1/2 teaspoon onion powder, 1/2 teaspoon black pepper, 1/2 teaspoon dried parsley. Preheat the oven to 400 degrees F. Line 2 rimmed baking sheet with parchment paper. Cut each bacon strip into 4 equal pieces. 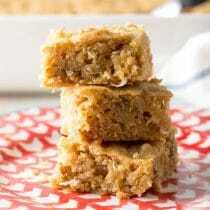 Place the 16 bacon squares on a baking sheet and bake for 15-20 minutes, until crispy. In a large bowl, mix the ground beef and French onion soup mix. 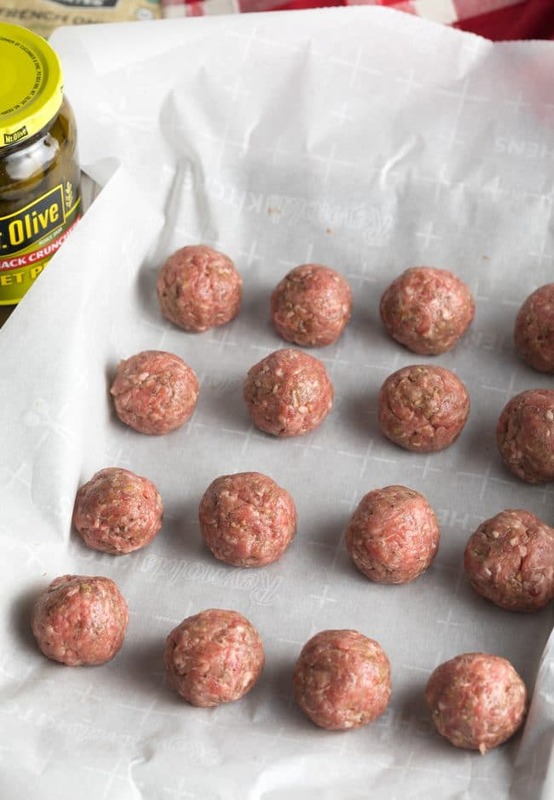 Roll the beef tightly into 16 - 1 ¼ inch balls. Place the meatballs on the second baking sheet. 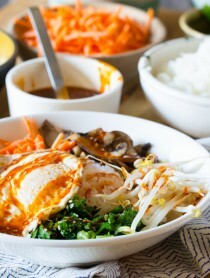 Meanwhile, in a small bowl, mix the ingredients for the Secret Sauce. Set aside. Cut each piece of American cheese into 4 pieces, for 16 small squares. Then slide a cherry tomato onto 16 toothpicks, followed by 16 mini pickles. Once the bacon comes out of the oven, slide a bacon square onto each toothpick. 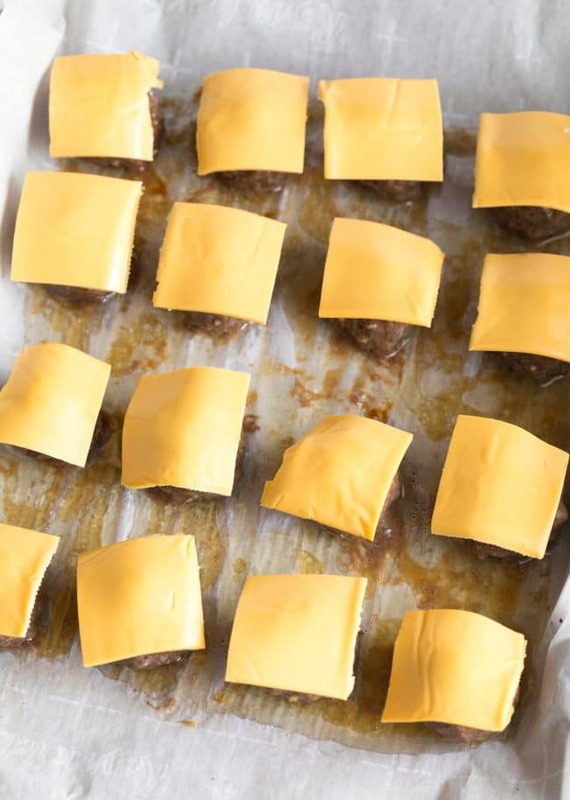 After the meatballs have been in the oven 15 minutes, place a small cheese square over each meatball. Bake for 1-2 additional minutes, to melt the cheese. While the meatballs are warm, press a toothpick down into each meatball, with the tomato end up. Serve warm with the secret sauce for dipping. For even lower carb use dill pickles. These burgers are so fun!!! And I am sure they are a big hit every time they are served. How cute! These are a great appetizer to any party. 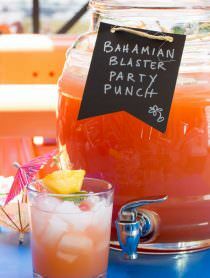 These were a hit at my party last night! Thanks! What a fun appetizer idea! My kids will love these! Such a fun and delicious party appetizer! So adorable and perfect for Super Bowl! This is such a great appetizer idea! Everyone in my house loved it! 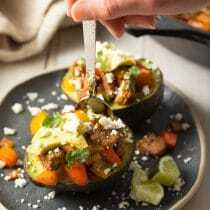 These looked so cute on the plate and my guests loved them! 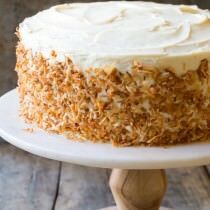 I’m making this for our Superbowl eats! These look gorgeous! Do you have a suggestion for how best to keep these warm, if I am bringing them to a party and the food doesn’t come out until half time? 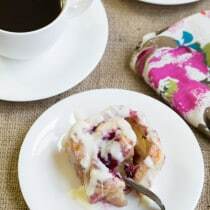 You could prep everything ahead and then bake and assemble right before halftime. However, they really do taste great as room temperature. Besides tasting amazing, these are such a cute appetizer! !